I was having technical trouble with my blogging app last night, sorry for the delay! From the Grimoire blog, Miyoshi. Simple, easy, and striking. Kaori, from the Grimoire Almadel blog. I love her use of a graphic t-shirt but a more casual, but still very eye-catching look! I also love the hat/hair combo she's been sporting lately. 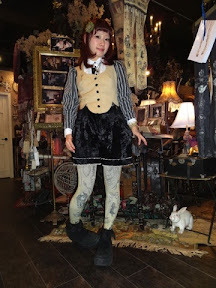 Also from the Grimoire Almadel blog, new shop girl Miwako. Miwako has been bringing a very dominant kodona/boystyle flavor to Dolly Kei, I hope she keeps it up! Boystyle in Dolly? What do we think? I like the thought of using trousers and even bloomers to add a boyish edge, same as brogue shoes and other more masculine accessories,whether that really falls into Dolly kei I dont know.